Poach the prawns in boiling salted water and peel when cooked (about a minute). Prep the salad ingredients. Pickle the shallots with a table spoon of cider vinegar, sugar and pepper and mix the sauce ingredients together. Toss the carrot, mango and banana blossom together with the dressing, then coarsely cut the hot mint into the mixture and add the prawns. 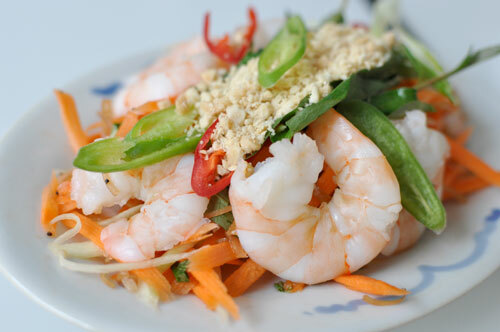 Serve immediately with crushed peanuts and coriander on prawn crackers. Also great in baguettes. You can also use chicken or squid instead of prawns and use sweet basil, mint or coriander instead of hot mint. TIP: Make sure all your ingredients are dry, for example, do not put the carrots through a blender as it becomes soggy.